(Nanowerk News) Australian scientists have found that the bacterium Cupriavidus metallidurans catalyses the biomineralisation of gold by transforming toxic gold compounds to their metallic form using active cellular mechanism. Researchers reported the presence of bacteria on gold surfaces but have never clearly elucidated their role. Now, an international team of scientists has found that there may be a biological reason for the presence of these bacteria on gold grain surfaces. "A number of years ago we discovered that the metal-resistant bacterium Cupriavidus metallidurans occurred on gold grains from two sites in Australia. The sites are 3500 km apart, in southern New South Wales and northern Queensland, so when we found the same organism on grains from both sites we thought we were onto something. It made us wonder why these organisms live in this particular environment. The results of this study point to their involvement in the active detoxification of gold complexes leading to formation of gold biominerals", explains Frank Reith, leader of the research and working at the University of Adelaide (Australia). This image shows maps of pure gold with other elements. By determining what elements there are, scientists can see where the gold is located in relation to the cells. 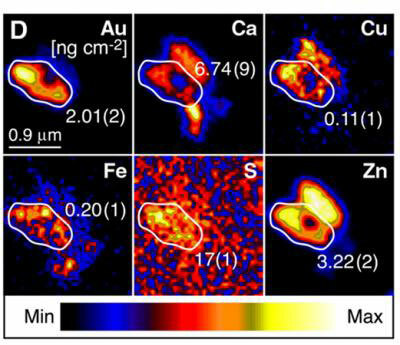 These maps are quantitative X-ray fluorescence maps showing the distribution of gold, calcium, copper, iron, sulfur and zinc in an individual cell after a minute exposure to Au(III) at pH 7.0 (the quantified area is marked in the image, and concentrations are in the image). The experiments showed that C. metallidurans rapidly accumulates toxic gold complexes from a solution prepared in the lab. This process promotes gold toxicity, which pushes the bacterium to induce oxidative stress and metal resistance clusters as well as an as yet uncharacterized gold-specific gene cluster in order to defend its cellular integrity. This leads to active biochemically-mediated reduction of gold complexes to nano-particulate, metallic gold, which may contribute to the growth of gold nuggets. For this study scientists combined synchrotron techniques at the European Synchrotron Radiation Facility (ESRF) and the Advanced Photon Source (APS) and molecular microbial techniques to understand the biomineralisation in bacteria. It is the first time that these techniques have been used in the same study, so Frank Reith brought together a multinational team of experts in both areas for the success of the experiment. The team was made up of scientists from the University of Adelaide, the Commonwealth Scientific and Research Organization (CSIRO), the University of California (US), the University of Western Ontario and the University of Saskatchewan (Canada), Martin-Luther-Universität (Germany), University of Nebraska-Lincoln (US), SCK.CEN (Belgium) and the APS (US) and the ESRF (France).